Ooops! The "Dr M collapses ..." piece was wrongly attributed to Malaysiakini in my original posting below. The Opposition-friendly news portal had merely processed the story and attributed it to the author of the piece, Umno Online. The headline was also Umno Online's. My apologies to both Malaysiakini and Umno Online. Bangsar, 5 Oct: Both the article and the picture (above) are by Malaysiakini so this is clearly not a piece by Umno or pro-Umno or Najib Razak's cyberwarriors out to demonize the Mahathir Mohamad. This is how the influential Opposition-friendly news portal sees it. In Malay, the headline cries Tersungkurnya Dr Mahathir di kaki DAP. You don't even have to read the article; the headline says it all. For me, the photograph did it. 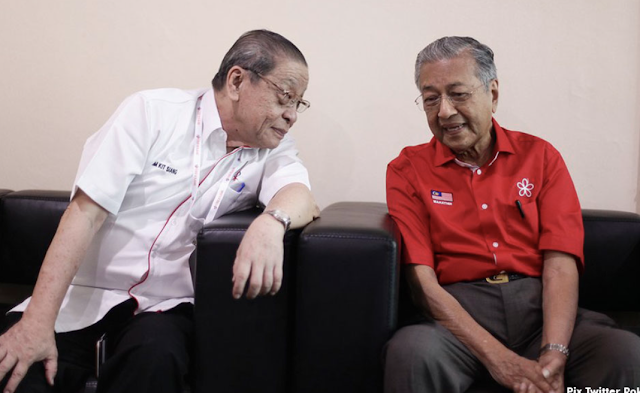 There is a twinkle in Lim Kit Siang's eyes that I was not aware of before (and I'm sure it has nothing to do with the RM1 billion dedak he was supposed to have received from the Old Man, an RPK accusation which, personally, I find too fantastic and I'm not saying it because Kit Siang just had to respond to ex-DAP Tunku Aziz's taunt by threatening to sue his accusers when a simple denial would do just as well!). "Ooops! The "Dr M collapses ..." piece was wrongly attributed to Malaysiakini in my original posting below. The Opposition-friendly news portal had merely processed the story and attributed it to the author of the piece, Umno Online. The headline was also Umno Online's. My apologies to both Malaysiakini and Umno Online." Anyway, don't read too much into pictures, kawan. This might be seen as a bunch of money-chasing mercenaries just prior to stabbing an old man in the back. Of course, I would never see it that way. Dtk, since you are quite learned on the body language,why don't you tell us on ur own words what it is? Maybe God hv given you the ability to read what the unspoken truth that most of us don't. If I were you Dato, I would have taken anything that comes from this weasel with a pinch of salt. This was the man who once swore a SD in 2008, implying that Najib's wife was at the scene where Altantuya's body was C4ed in 2006. When there were news of his imminent third arrest under ISA, he fled to the UK in 2010. Unfortunately 2 years later, to the dismay of the opposition and his readers who once worshiped him as the greatest whistleblowers to the government’s dark secrets, he switched side. Today, I guess even Dato Ali Alhabshee of UMNO's Cheras Division, would have regretted that he had once demanded the government to strip RPK of his citizenship.